Richards Bay is one of South Africa's biggest ports, situated on the 12 square mile (30 sq km) lagoon of the Mhlatuze River. It began as a makeshift harbour set up during the South African War of 1879 and is named after its founder, Sir Frederick Richards. The specialised ships that call are a must-see for maritime buffs. The town is a bustling business centre, featuring every modern facility and offers plenty of recreational facilities for visitors. Tourism in Richards Bay is thriving and it's fast becoming a popular north coast holiday destination, with spectacular scenery on offer and pristine golden beaches gently lapped by the warm waters of the Indian Ocean. Tourists can enjoy plenty of adventurous activities such as fishing, kite-surfing, yachting, and kayaking. Humpback dolphins and whales are frequent visitors to the waters around Richards Bay and can be viewed from a specially erected viewing point at Alkantstrand Beach. 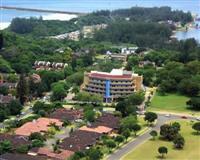 While the town itself is fairly sleepy, Richards Bay offers tourists entrance to the beautiful and diverse Zululand. Additionally, a multitude of game reserves are within an hour or two's drive of the town. Hluhluwe Umfolozi Park proves a big hit with nature lovers, featuring the Big Five (elephants, lions, leopards, buffalo, and rhinos) as well as cheetahs, wild dogs, and nyala. Lake Mzingazi, the primary water supply of Richards Bay, is a popular tourist attraction. Visitors can view crocodiles and hippos as well as over 350 species of birds, making it a birdwatcher's paradise. The surrounds of Richard's Bay have vast expanses of untouched and unspoilt indigenous vegetation, as well as natural lakes and marshes. This makes it one of the most picturesque tourist destinations in the country.